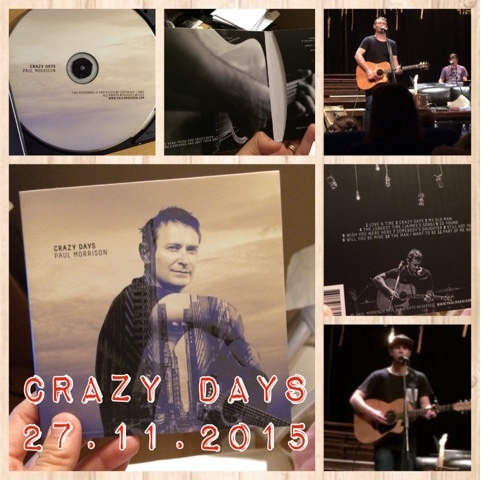 I went to the launch of Paul Morrison’s new album, Crazy Days, last night and it was pretty amazing. It’s been 8 years since he last released an album (he’s released individual songs over the years, a couple in conjunction with the West Coast Eagles); and incidentally I was at his last album launch as well, which was at the same venue (in 2007). His support act was a young WA talent, Ben Blondel playing as Death and a Cure. Produced by Chad Blondel (probably related?) who also produces Morro. Death and a Cure performed a short six (?) song set. His guitar skills impressed me. And I really liked the song This Disease. Look it up, you can find his back catalogue on Aussie iTunes. After his set we had a short break before the host introduced Morro. His set began with a video that Adam Meredith (Senior Pastor of Red Door Community Church, the venue of the gig) had created for one of Morro’s songs; Will You Be Mine. If you only know Morro for his radio gig and/or as the chaplain for the Eagles, then you don’t know what you’re missing. He is one of my all time favourite singer/songwriters. He interspersed his singing with talk and stories 🙂 and half the set was just him and his guitar and sometimes harmonica as well. Amazing and beautiful. It’s the 4th of November and I thought I’d give you another little update of where Mark and I are at. First off, he’s started his new job and is really enjoying it. He’s a greeter at the entrance to Target, perfect job for him. Backtracking a little, we finally found out what was wrong with him (probably); it was a reaction to the antibiotics they put him on…go figure. Anyway, he’s over that and we’re tracking OK in that regard. I’m in the babies room at work this week, and seriously that’s the best thing. Or maybe the worst thing? Haha, not helping my cluckiness, that’s for sure. I have sciatica. That is I have pain in my left leg which is being caused by a disc in my spine pressing on the sciatic nerve. It’s a pain, literally; but I’m getting treatment and it’s not effecting my ability to work. I have no car anymore because my baby got crashed into last month. It got written off and I will eventually get a pay out from it. So, we’ll be able to get a relatively decent secondhand car if we decide to do so. Another thing at work, my centre has employed a male educator, which I think is fantastic. There are not many men working in early learning education, as teachers or in centres, so I think it’s wonderful to see. Especially, young men who are passionate about education in the early years. I think it’s sad that the negative stigma of men in the profession is what drives them away. We need men in the profession because many children need positive male role models in their lives. In a less serious note, November 1st marked 11 years of me being a Simple Plan fan. They also released their official first single off their 5th album last month. Good Charlotte is apparently back. And this Friday night Mark and I are off to watch the basketball at Perth Arena: Wildcats v Crocs (my Tville boys :)).